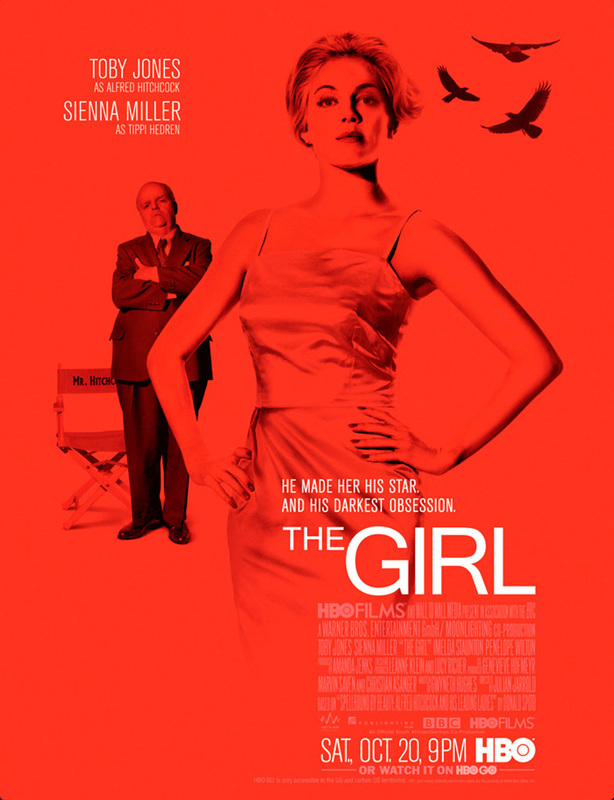 Check out the movie poster and trailer for HBO’s Alfred Hitchcock and Tippi Hedren biopic The Girl, starring Toby Jones, Sienna Miller and Imelda Staunton. The Julian Jarrold-directed HBO film stars Toby Jones as Alfred Hitchcock and Sienna Miller as Tippi Hedren, and tells the story of the director’s obsessive relationship with his leading lady during the making of “The Birds” and “Marnie.” As he attempted to sculpt Hedren into the perfect Hitchcock blonde of his imagination, he became obsessed with the impossible dream of winning the real woman’s love. Her rejection of his misguided attempts only added to his obsession, putting both their careers and personal lives in jeopardy. The Girl premieres Saturday, October 20th, 9pm on HBO.